NOTE -- The State Master appoints a Deputy force as his eyes and ears across the state -- to properly encourage and advance Grange work and activities. The duties of the Deputies shall be to organize and reorganize Granges, to see that duly elected Officers of Granges are properly installed, and to aid in the conduct and promotion of all Grange meetings and programs. They shall be vigilant that no disorder shall exist in the Granges within their jurisdiction. OCTOBER 5, 2014 -- It's hard to believe this is the last of our four years in this administration. There's been a lot of work to do and even more work lies ahead for the next administration. There always is! MAY 5, 2014 -- During the last six (or more) months, we have been working with Granges to make sure Executive Committee Reports, Steward's Inventories and By-Laws have been properly filed with the State Grange. 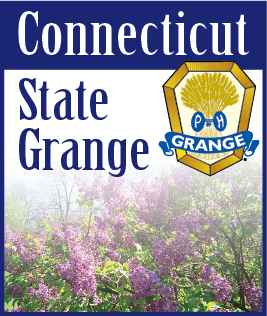 Visit the Downloads page to find numerous forms and more available for download for all aspects of the Grange in Connecticut. Deputy Corner: Spring is coming! There are spies among us! Become familiar with the unwritten work of the Grange - Earn the Code Reading Award of Merit.